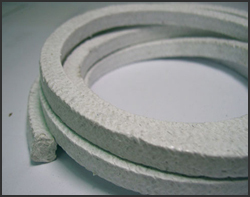 Asbestos PTFE Packing : Fiber Glass Rope Manufacturer, Asbestos Graphite Packing, Asbestos Millboard Sheet, Asbestos Friction Products, Asbestos Brake Liner. Packing: 6mm & Above - 1 Kg., 2.5 Kgs. & 5 Kgs. Service: Chemical, solvents, oils and petroleum by products and oxygen service.